Numerous procedures in biology and medicine require that cells be counted. On almost all occasions, what gets counted is actually the concentration of the cells (for example: 5,000 cells per milliliter). By counting the cells in a known volume of a culture, the concentration can be assessed. In medicine, the concentration of various blood cells, such as red blood cells or white blood cells, can give crucial information regarding someone’s health. Similarly, the concentration of bacteria, viruses, and other pathogens in blood or bodily fluids can reveal information about the progress of an infectious disease and about how a person’s immune system is dealing with the infection. Knowing the cell concentration is important in molecular biology experiments in order to adjust the amount of reagents and chemicals applied to the experiment. Counting Colonies: An example of counting colonies on a streak plate. 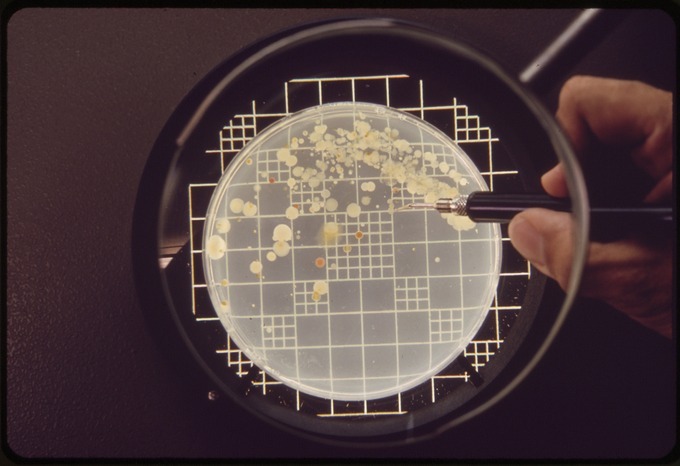 Direct counting methods include microscopic counts using a hemocytometer or a counting chamber. The hemocytometer works by creating a volumetric grid divided into differently sized cubes for accurately counting the number of particles in a cube and calculating the concentration of the entire sample. One can also quantify the number of cells in a culture by plating a known volume of the cell culture on a petri dish with a growth medium, which is also known as a streak plate. If the cells are distributed on the plate properly, it can generally be assumed that each cell will give rise to a single colony. The colonies can then be counted and, based on the known volume of the culture that was spread on the plate, the cell concentration can be calculated. Bacterial colony counts made from plating dilutions of bacteria are useful to estimate the strength of bacterial infections; for example, a urinary tract bacterial infection. As with hemocytometers or counting chambers, cultures need to be heavily diluted prior to plating. Otherwise, instead of obtaining single colonies that can be counted, a so-called “lawn” of thousands of colonies will form, all lying atop each other. Additionally, plating is the slowest method because most microorganisms need at least 12 hours to form visible colonies. These methods of direct counting do not require sophisticated instrumentation, so they can easily be performed in most laboratories. Directly counting blood cells or tissue cells by using a hemocytometer can determine the concentration of a known volume. Counting the number of colonies that arise on a pour plate can calculate the concentration by multiplying the count by the volume spread on the pour plate. Direct counting methods are easy to perform and do not require highly specialized equipment, but are often slower than other methods. hemocytometer: A device that counts microscopic particles. The hemocytometer works by creating a volumetric grid divided into differently sized cubes for accurately counting the number of particles in a cube and calculating the concentration of the entire sample. streak plate: A petri dish with a growth medium.